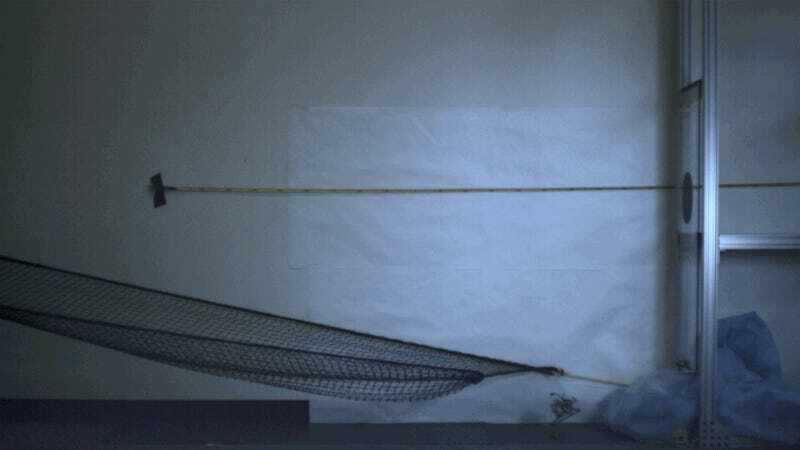 Meet Salto, a UC Berkeley-designed robot that, like a parkour athlete, can string together consecutive vertical jumps. Its developers hope to use the robot in search-and-rescue missions, where it can dart around quickly across complex landscapes. Salto (which stands for “saltatorial locomotion on terrain obstacle”) is the brainchild of UC Berkeley roboticist Duncan Haldane, who sought to test a new way of building jumping systems. As described in the inaugural edition of the journal Science Robotics, Salto uses a crouching and energy-storing strategy that’s found in animals such as the galago, or bushbaby, a small nocturnal primate that’s highly adapted for jumping. Like the galago, Salto can jump both high and fast. It can perform a standing jump of up to three feet (one meter), and then perform the exact same jump again as soon as its foot touches down on a surface. The bio-inspired trick is called “power modulation,” and it not only helped Salto to make the highest vertical jump ever recorded in an untethered robot, it also resulted in a completely new robotic wall-jumping behavior, one familiar to those who partake in parkour. This new method of locomotion could allow future robots to jump around in rubble during search and rescue missions. Animals like the galago have a “super-crouch” posture that lets them stay down longer, giving their muscles more time to stretch their tendons. When they come up from that posture, all of the energy stored in their tendons gets released very quickly, allowing them to make huge jumps. Galagos can jump five times in just four seconds, and when they tether their jumps together, they can traverse a distance of up to 28 feet (8.5 meters). Such heights would not be attainable with muscles alone. By using power modulation, Salto doesn’t need to wind up before a jump. As soon as it makes its great leap, it’s ready to jump again. Salto currently weighs 3.5 ounces (100 grams) and is 10.2 inches (26 cm) tall when fully extended. 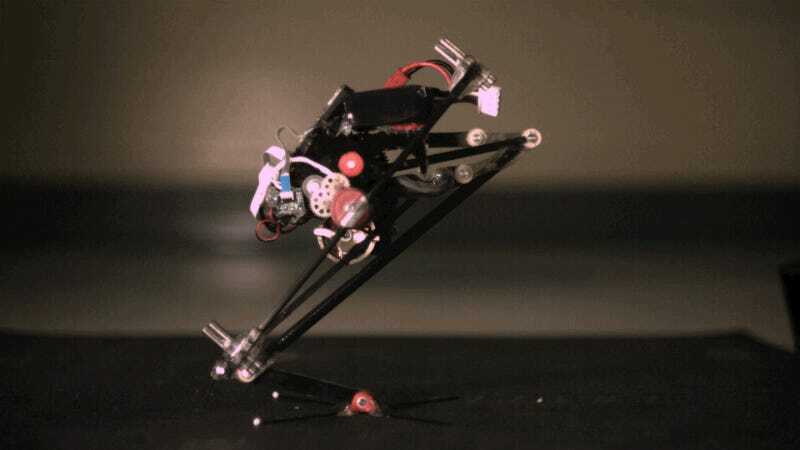 The robot can jump up to a little over three feet, and when doing its dramatic wall-jump can achieve an average height gain of nearly four feet (1.2 meters). Salto can jump at speeds of 1.75 meters per second, besting the bullfrog’s 1.71 meter per second leap. But Salto is still not as speedy or as proficient of a high-jumper as the galago, which achieves speeds of up to 2.24 meters per second. To make Salto even better, Haldane says he’d have to chase down sources of friction, reduce the robot’s weight, and give the motor a little more power. “I haven’t set fire to any motors yet, so we’re definitely erring on the conservative side of things and not pushing the envelope too much,” he told Gizmodo.